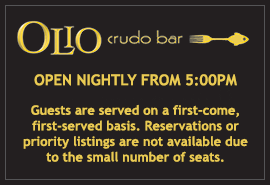 Please use this form for Private Dining and Groups of 12 or larger only. For regular reservations please call (805) 899-2699 Option 1 during operating hours. To ensure our reply to you doesn’t go to your spam folder, please add “info@olioelimone.com” to your list of authorized senders. We will respond to your inquiry as soon as possible, normally during the same business day and within a maximum of 24 hours. Submittal of this form does not constitute confirmation of any reservations, private or group dining availability, or any type of guarantee. To ensure delivery of Olio e Limone Ristorante correspondence to your inbox, please add info@oliocucina.com to your Address Book or Safe Sender List. PLEASE ALSO CHECK YOUR JUNK/SPAM FOLDER.